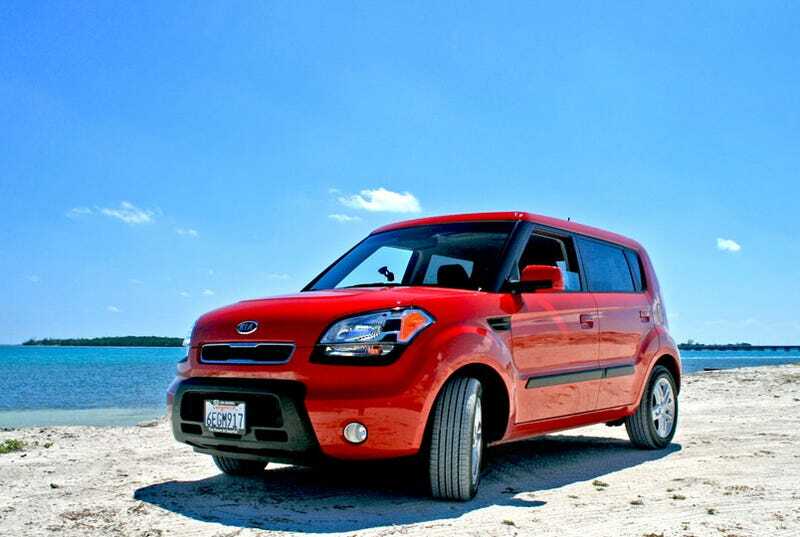 The 2010 Kia Soul isn't the first boxy subcompact and it probably isn't the best, but with a low price, good styling and plenty of space, it may be the most appealing Kia yet. Full Disclosure: Kia wanted me to drive the new Soul so badly they flew me out and put me up in a nice hotel to make sure I wrote about it. Also, they fed me Key Lime Pie. The Pie wasn't that bad. As with the original Scion xB and Nissan Cube, Kia decided the Soul should be a tall box quasi-CUV subcompact able to fit a large space in a small package. Or maybe that's a large package in a small space. Regardless, unoriginality sells. In a fashion similar to its bigger brother Hyundai, the brand decided to raid an established segment and offer more features, space and power at a competitive price. It's the: "we weren't the first to put sprinkles on donuts, but we'll happily put more on one" philosophy of product development. Hands-free Bluetooth connectivity, iPod/USB integration, satellite radio, ABS, disc brakes all around, A/C and a full suite of airbags are just some of the features standard on 95% of all Souls going to market. The $13,300 base Kia Soul gets a 1.6-liter inline-four capable of putting out 122 HP and 115 lb-ft of torque, while the higher-end models get the 2.0-liter inline-four good for 142 HP and 137 lb-ft. All cars come standard with a five-speed manual and have the option of a four-speed automatic. The car's "+" trim adds 16-inch wheels and added control for $14,950, while the Sport and Exclaim go up to $16,950 and add 18-inch alloy wheels, more interior options and a larger six-speaker stereo. The sportiest model is differentiated by a thicker anti roll bar, imperceptibly mild suspension tune and metal pedals. Even with the larger motor, the Kia Soul isn't about performance. With the five-speed, 2.0-liter fourbanger and a little luck or skill you can achieve a 0-to-60 MPH time in the low eight-second range. To the average Kia buyer, what's going on inside the car is more important than performance. If space is a key component, the 53.4 cubic feet of interior cargo space with the rear seats down may be an issue (the xB has 69.9 cubic feet, the Cube 58.1), though the under-floor storage is a nice touch. For customers concerned with style and comfort, the Soul may actually win them over with its larger seats, reasonable space and funky-yet-intuitive dash complete with a crystal clear display. The idea behind the Kia Soul is to separate the brand's future from a past marked by crappy products produced at a low cost. We have no problem claiming this is the best-designed Kia because, for the first time, it looks like someone has actually taken the time to design one. The brainchild of the company's California-based design center, this is one Kia that doesn't feel like a Korean cast-off. It's hard to stand out in Miami given the abundance of partially undressed woman and white Lamborghinis, yet the Kia garnered a disproportionate amount of attention and not just because we were driving like tourists. It looks different. And for an economy car, with the stick shift and comically oversized 18-inch wheels, it actually drives like something just a little different, offering quicker-than-expected steering and less-than-expected lean when really pushing it. If you're in the market for a fun compact car you'll love, the Soul isn't your best option. If you're in the market for a cheap Korean compact car you won't hate, the Soul may be your only option.